Prion protein PrP. Flexible portions of the protein that are not included in the structures are shown with dots. Prions are proteins that can adopt two different forms, a normal form and a misfolded form. This may not seem unusual, since many proteins are flexible and adopt different shapes. However, prions have another unusual characteristic: the misfolded form of the prion can force normal prions to change into the misfolded shape. In this way, a few misfolded prions can corrupt a whole population of normal prions, converting them one-by-one into the misfolded shape. This can have deadly consequences, as the levels of misfolded proteins build up. For instance, misfolding of the PrP prion causes fatal neural diseases in humans and other mammals. To make things worse, misfolded prions are infectious, so a small dose of misfolded prions can infect and corrupt an entire organism. The normal form of the prion protein PrP (shown here) is found on the surface of nerve cells, but when it changes into its misfolded form, it aggregates into long fibrils that clog up the normal functioning of the brain. Infection occurs when a little bit of the misfolded protein is eaten or accidentally gets into the blood through an injury. A devastating example occurred in a native population in Papua New Guinea, where ritual cannibalism was part of funeral ceremonies. The epidemic probably started when one person developed the disease spontaneously (PrP occasionally adopts the misfolded state all by itself, causing very rare sporadic cases of the disease). Then the misfolded prions spread through the community when the infected person was eaten. More recently, there has been concern that the prions that cause mad cow disease could spread to humans by eating infected meat. The cow PrP protein is very similar to human PrP, and several cases of this type of infection have been seen. The normal prion PrP is a flexible protein composed of several parts. The picture shown here is constructed from several PDB files. The large domain at left is from PDB entry 1qm2 . It has a lipid attached at the bottom, which normally anchors the protein to the surface of nerve cells, and two carbohydrate chains (all shown in orange, and not included in the PDB file). The rest of the protein chain is largely flexible, and two portions of it have been studied by NMR spectroscopy, in PDB entries 1oei and 1skh . In spite of years of intense study, PrP still holds many mysteries. It is found on nerve cells, but its precise function is still a matter of conjecture. Also, researchers have not yet discovered the structure of the misfolded, infectious state of PrP. The structure on the following two pages, however, will give you some idea of what might be happening. Amyloid complex of prion protein HET-s. Nature is always full of surprises, and prions are no exceptions. Although they cause a terrible disease in humans and other mammals, they are also used for specific tasks in other organisms. For instance, some fungi make the prion protein HET-s, shown here in its misfolded form from PDB entry 2rnm . It plays a specialized role in the growth of the fungi. Some individuals have a form of HET-s that only adopts one form, and others have a slightly different version of the protein that can adopt both forms. When neighboring colonies meet each other, they often mate by fusing cells together, forming large cells with many nuclei. However, these fused cells die if they have incompatible forms of the HET-s protein. This may be an advantage because it enforces diversity in the population, keeping some colonies separate and perhaps limiting the spread of viral infections. In the misfolded state, prions form a tough fibril. 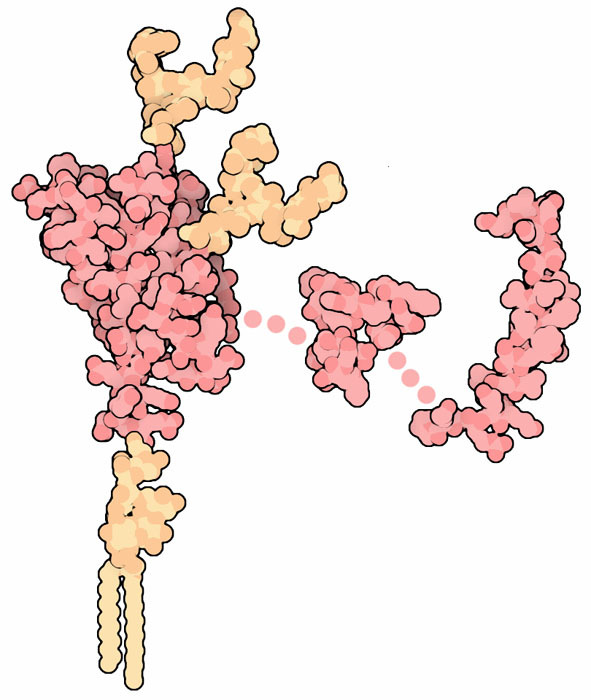 A first look at one of these fibrils is available in PDB entry 2rnm , which includes part of the fungal HET-s protein. 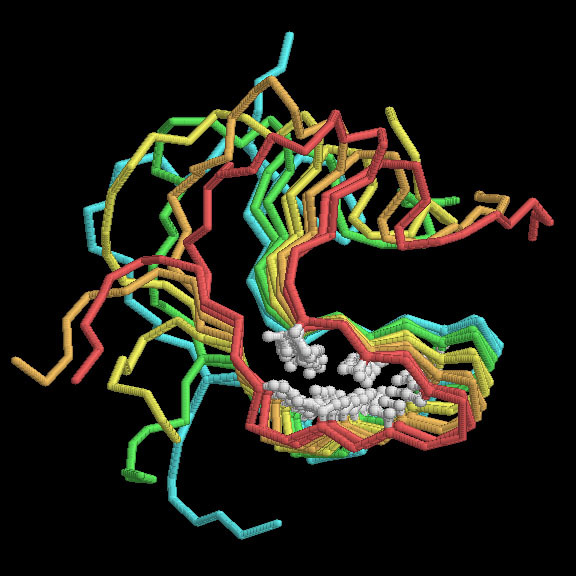 Six protein chains are included in the PDB file, stacked to form a long solenoidal structure. Hydrophobic amino acids (in white) are packed inside a triangular pocket, stabilizing the whole structure. To explore this structure in more detail, click on the image for an interactive JSmol. D. M. Fowler, A. V. Koulov, W. E. Balch and J. W. Kelley (2007) Functional amyloid--from bacteria to humans. Trends in Biochemical Sciences 32, 217-224. D. A. Harris and H. L. True (2006) New insights into prion structure and toxicity. Neuron 50, 353-357. J. Collinge (2005) Molecular neurology of prion disease (2005) Journal of Neurology, Neurosurgery and Psychiatry 76, 906-919. S. B. Prusiner, M. R. Scott, S. J. DeArmond and F. E. Cohen (1998) Prion protein biology. Cell 93, 337-348.